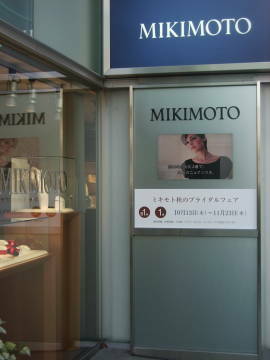 A gorgeous Mikimoto Necklace Pearl beckoned us to enter the Nagoya Mikimoto Jewelry store. Mikimoto necklace pearl pictured below was a sample of four floors of Mikimoto jewelry and products. On our way from Tokyo to Osaka we made a quick stop in Nagoya to see the Mikimoto store. As soon as we arrived at the train station I noticed people wearing creative styles and more pearls (especially long strands) than I'd seen elsewhere in Japan. I took the subway to the Sakae stop. Nagoya on this zippy Saturday was a vibrant place with a live rock bank playing on a large open corner and music broadcast through the streets in other places. 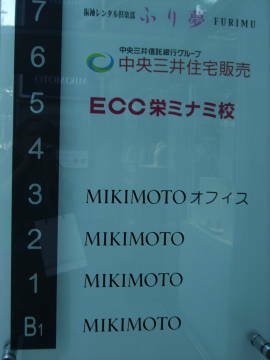 Here I asked a smartly dressed girl if she knew where the Mikimoto store was. She didn't, so I started walking after photographing a large Tiffany jewelry store on the corner. After some meandering and retracing my steps, my new friend crossed the street and approached me. She'd phoned a friend who told her the Mikimoto pearl store was a short distance away. She happily pointed me in the right direction and I was glad for her help. All over Japan, we encountered friendly people who sensed our need for guidance and gladly came to our rescue. In the window this $125,000 Mikimoto necklace pearl and gold beauty beckoned us to enter. It consisted of several rows of seed pearls twisted together for a rope-like choker embellished with decorative vines. The manager, Mr. Mamoru Nakagawa, not only had heard of Iowa, where I'm from, but had investigated Palmer College in Davenport, only twenty minutes from my home. Instead of attending Palmer, he started working for Mikimoto fifteen years ago. He said the Mikimoto company gives extensive training both out of books and on the job. In the basement I viewed the Mikimoto International items, including baby gifts and asked Mr. Nakagawa, if he had children. "So, you give Mikimoto gifts to them?" I asked. "I must," he replied, smiling. "Lucky kids", I thought to myself. 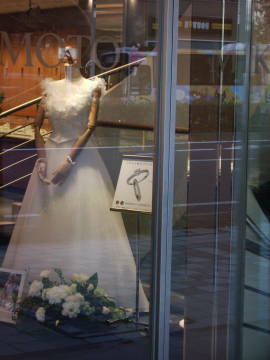 Also in the basement were Mikimoto necklace pearl bridal rental jewelry including tiaras and necklace sets. The Bridal dress in the entryway was a good sign that bridal jewelry could be purchased or rented here. 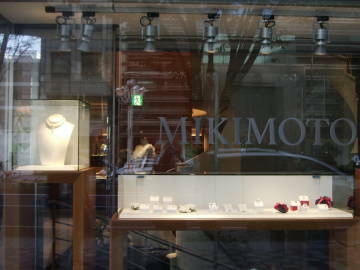 The store carries many Mikimoto International items as purses with the "M with O" Mikimoto marking, Mikimoto ballpoint pens, jewelry boxes, and tiny new boxes grouped together. The first floor displayed beautiful jewelry including brooches and pendants while the second floor held the finer Mikimoto necklace pearl choices with lots of single strand Tahitan and large South Sea single strand pearls. Mr. Nakagawa escorted me to all floors and made sure I had Mikimoto booklets and placed them in a gift bag for me. The store was busy with couples picking out wedding rings and ladies buying Mikimoto necklace pearl strands for which they could chose their own clasp. Here I enjoyed seeing in person the famous pearl quality triangle display filled with real pearls. The best of the best pearls at the tip top and the uncoated nuclei at the bottom clearly demonstrates the high quality of Mikimoto necklace pearls. Mr. Nakagawa pointed out to me that Mikimoto jewelry only uses the top two sections of this triangle...the "Best of the Best". 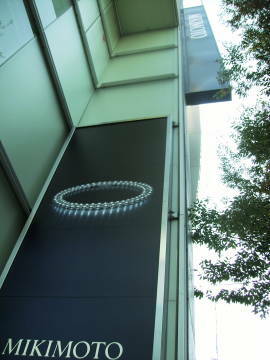 A rotating video sign outside demonstrated the available Mikimoto necklace pearl products inside. 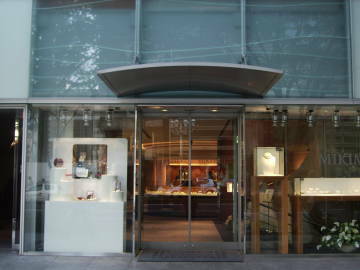 Once again, I'm stuck with not only the quality of the Mikimoto stores around the world, but the amazing real estate holdings due to the locations, which, in Nagoya, as in New York, is quite close to Tiffany's. Each store leaves an impression, not so much because of the quality of the jewelry, but of the quality of kindness of the employees. 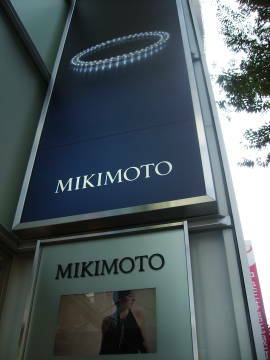 Return here to main store page after reading about the Mikimoto necklace pearl at Nagoya.